Welcome to the new www.jetblue.com. 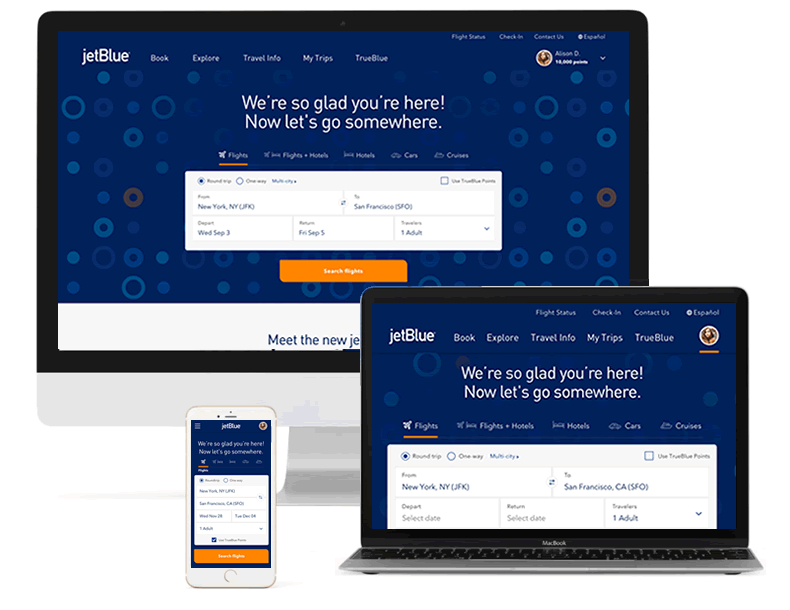 Our team has been hard at work redesigning the digital experience, and we’re excited that our new and improved website (www.jetblue.com) is now live. 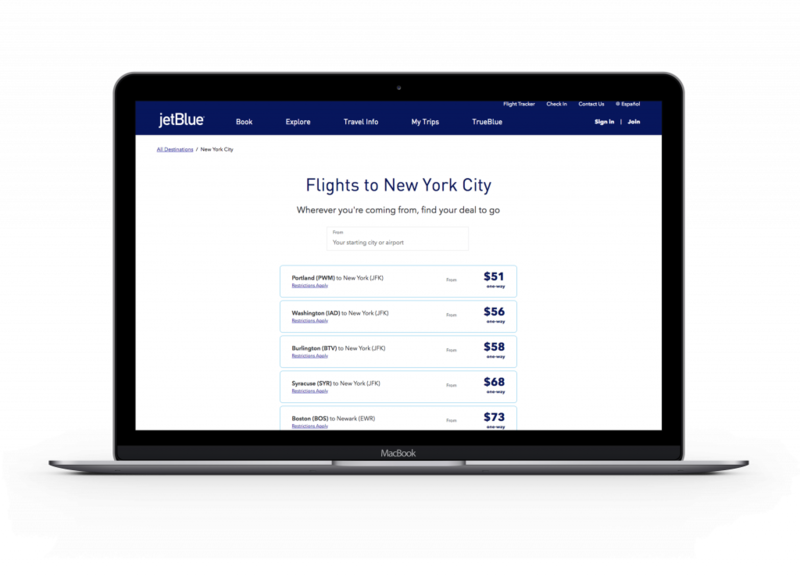 Now, www.jetblue.com features a fresh look that’s optimized to the screen size of the user’s device, and navigation that makes it simple to find what you’re looking for. Book a flight, Explore destinations, view Travel Info, see upcoming travel plans via My Trips, and manage your TrueBlue account. The Explore feature on jetblue.com makes it easy to find the best fares from your city. Plan your next trip by searching for everyday low fares from other cities, too, all in one place. Whether you have specific travel dates and destinations in mind, or need some inspiration, you’ll be able to find what you need to book your trip. Behind the scenes, we’re offering faster and more reliable connectivity, allowing you to seamlessly experience the full range of benefits available when booking directly through www.jetblue.com. You also have more options than before when managing an existing flight on mobile. 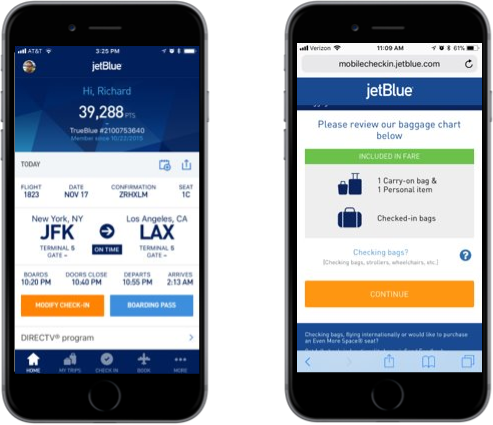 The website redesign follows the refresh of JetBlue’s mobile app, which was the recipient of this year’s Webby People’s Voice Award in Mobile Sites & Apps: Best User Experience. You’ll notice even more enhancements to the site over the coming months. Some features to look out for include ApplePay, one-click check-in, customer service web chat, and more options to earn, share, and spend TrueBlue points. We partnered with Big Spaceship, a digital design agency, to revamp our digital look and feel. You’ll also notice enhancements to the digital experience while traveling, via improved information displays at airports. The future of travel is evolving, and these digital updates enable us to continue making every part of the customer experience as simple and personalized as possible. Looking forward to seeing you on the new www.jetblue.com!